Chicken Faux Gras ~ I Can Do That! Liver has never been a favorite in my house. When I was a teenager my mom used to force pork liver steaks and onions on me and my sisters once every two weeks and the ritual probably made me averse to any kind of liver. 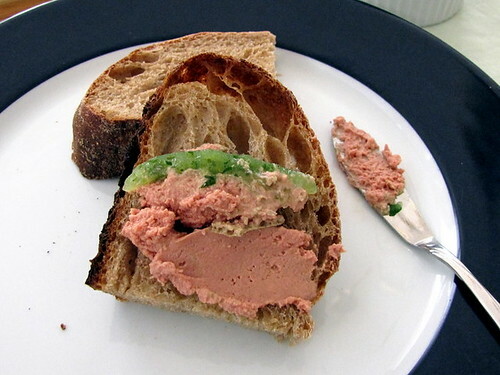 As an adult I seldom ate it, maybe once in a blue moon I add liverwurst sparingly when a recipe calls for liver. My taste buds have changed recently because the past year I have started to appreciate it more and more but in small doses adding it to meat paté and a few Filipino pork dishes. Since I started baking a lot of bread I have been looking for more ways to eat them other than sandwiches. Reading Michel Richard's Chicken Faux Gras from his cookbook HAPPY IN THE KITCHEN, the pate sounds like a very good spread for the breads. The recipe is so rich and Michel describes it in the cookbook as "absolutely the creamiest thing on earth" and he is of course "absolutely" accurate. It is rich and creamy and melts in your mouth delicious. It's perfect not just as appetizer but also for lunch, dinner, and this morning for breakfast too. Prepare the Mousse: Put oven rack in middle position and preheat oven to 300ºF. Cook onion in 2 tablespoons butter in a small saucepan over moderately low heat, covered, for 5 minutes. Stir in garlic and cream and simmer, covered, until onion is tender, about 6 minutes. Remove from heat and stir in remaining butter, then return to heat and stir until butter is melted and mixture is combined. Purée livers with onion mixture, sea salt, and pepper in a blender, scraping down sides as necessary, until smooth. Force mixture through a fine-mesh sieve into a large measuring cup. Bring a teakettle full of water to a boil. Evenly space ramekins in a 13- by 9-inch roasting pan. Divide liver mixture among ramekins, then cover each ramekin with foil and place roasting pan in oven. Pour enough boiling water into pan to fill pan halfway. Bake until mousse is just set, about 30 minutes. Remove foil and transfer ramekins to a rack to cool to room temperature, about 1 hour, then chill mousse, covered, at least 3 hours. Prepare gelée once mousse is cold: Chop half of cucumber and reserve remainder for another use. Purée chopped cucumber in a food processor until liquefied. Pour through a fine-mesh sieve into a liquid measuring cup (you should have 1/2 cup cucumber water; if not, chop and purée more cucumber). Sprinkle gelatin over ¼ cup cucumber water in a small saucepan and let stand 1 minute to soften. Heat gelatin mixture over low heat until gelatin is melted. Remove from heat and stir in the remaining cucumber water, lemon juice, sugar, Tabasco, and parsley. Cool gelée 5 minutes, then spoon about 2 tablespoons over each mousse. Chill until gelée is set, about 1 hour. Bring mousse to room temperature, about 30 minutes, before serving. Oh Oggi, I am too big of a baby to even try the liver, but a slice of that bread would make me smile any day of the week! That looks delicious. I wish I could try a slice of every one's beer bread and see how different they all are. Juliana, thanks. 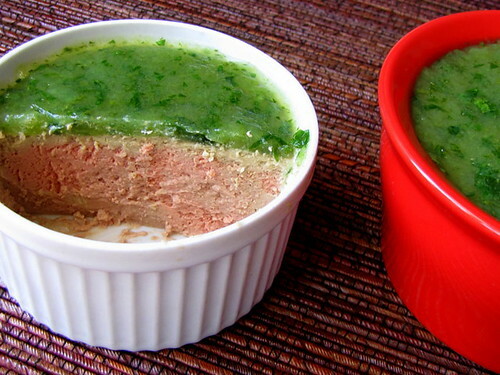 The parsley gelee with the cucumber water adds a cool tongue-feel to the pate.